The Terrain generation nodes add a terrain to your project. All the generation nodes have editable parameters. Perlin noise: This node creates a terrain using a Perlin noise generator. Ridged noise: This node creates a terrain using a Ridged noise generator. Billowy noise: This node creates a terrain using a Billowy noise generator. Cellular noise: This node samples points across the terrain that act like mini-generator diffusing an elevation around them, thus creating cell-like structures. Constant elevation: This node creates flat ground, whose width, height, quad size, and altitude are defined. 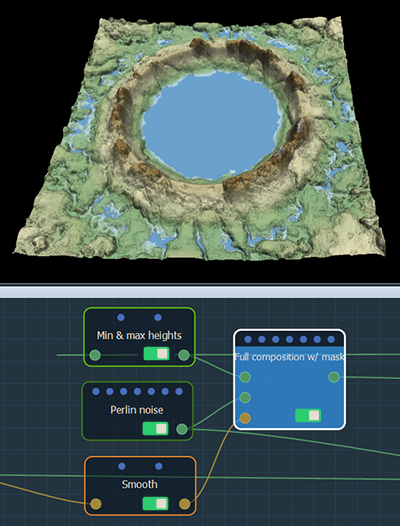 Slope: This node creates a terrain plane with an editable inclination and orientation. Half-sphere: This node creates a half-sphere or semi-ellipsoid plot. Cone: This node creates a terrain in the form of circular cone. Circular symmetry: This node creates a circular cone-shaped terrain. Profile curve: This node creates a terrain from a curve. Mandelbrot set: This node creates a terrain in the form of Mandelbrot set.